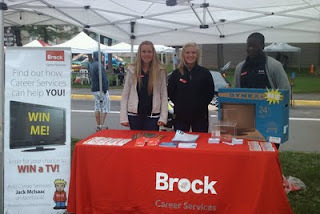 Welcome to Brock University! Get used to calling this campus home because trust me, you’ll be here as long as you’re not sleeping (and sometimes even then!). O-Week is prime time for you to venture the campus, meet your roommates, find your classes and get free stuff! If you’ve already been at Brock for a while, welcome back! It’s our duty to pass on our words of wisdom to freshmen regarding Frosh week. BUSU plans a jam-packed schedule every year to get students acquainted with Brock. The first day (today) starts up with the Vendor Fair. This is where you can scope out tons of Brock clubs and services and fill your bag with stuff! Visit our booth for a chance to win a television and get more information on Shop for Jobs. The rest of the week can get pretty messy between concerts, barbeques, dances, bonfires etc. Have a great week! You know where we’ll be if you have any questions about work and your degree!